This protocol was developed by Arkansas Pharmacist Josh Winningham, Pharm.D and is part of a wide range of services that his company, PhytoPharm.D. PhytoPharm.D has developed this low and slow protocol to help patients get to a therapeutic dose without unwanted side-effects. When dispensaries open in Arkansas, PhytoPharm.D will be available for scheduled patient consultations and on-call for product or drug interaction questions. When a patient takes a pharmaceutical medication that has the intended effect and has minimal-to-no side effects, that is considered a successful treatment. This same train of thought applies to medical cannabis. Patients are seeking cannabis treatment in order to improve their quality of life. A low and slow dosing plan can, and will, limit the number of adverse reactions. While there are many different ways to consume cannabis, patients should start with an inhaled product unless there is a pre-existing condition that would preclude this therapy. Inhaled products have the benefit of having a quicker onset (effects usually peak within 15-30 minutes) and a shorter duration of action (effects conclude after 2-3 hours). For first time cannabis users this shorter duration of action means that if a negative effect does occur, it will subside quicker than when using other consumption methods. Patients should start with an low-to-no THC:CBD inhaled product at a dose of less than 5 milligrams. After a patient has reached a steady dose on an inhaled product, it may be beneficial from a health and healing standpoint, or personal preference standpoint, to switch to an orally consumed product. Medicinal products designed for oral consumption are usually made from one of three base processes: tincture, infused oil, or extracted/concentrated oil. Progression through the low and slow medicating profile should occur in that order: tincture, infused oil, and then extracted/concentrated oil. No matter the type of edible, similar to inhalation, begin with a low-to-no THC:CBD ratio product at or below 5 milligrams per dose. Patients should start with a tincture as the first orally consumed product. This is due to tinctures having a similar effect in the body as inhalation. This means a smoother transition with less chance for additional adverse effects. As with inhalation, the effect from tinctures peaks in around 15-30 minutes, and the effects subside within 2-3 hours. Arkansas has regulated that each dispensary must work with a consulting pharmacist to ensure a high standard of care for consumers, but this impacts dispensary margins. Contracting the consulting requirement to PhytoPharm.D allows dispensaries to meet regulations without the high overhead burden of paying an in-house pharmacist full-time. 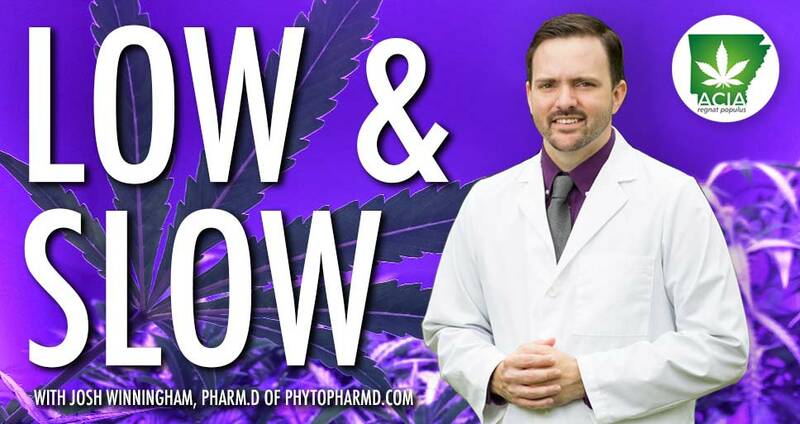 For more information on how PhytoPharm.D can assist with your dispensary or cultivation facility, click here to connect with Josh Winningham, Pharm.D.